Non-toxic glue, replenshible rubberwood…you can’t go wrong with Plan Toys when seeking out truly eco-friendly play. We have long been a fan of Plan Toys (my son loves the trucks), and yes, sometimes we need to reglue parts, but that’s to be expected with wooden toys. The set includes a cake with toppings, a cake turntable, a cake server and an icing bag. The cake can also be cut into 6 slices. Great for pretend or imaginative play. Under the Green Concept Design PlanToys selects only materials and manufacturers utilizing a minimal waste concept. PlanToys long-term commitment to social programs promotes healthy child development and environmental protection. All PlanToys are made using chemical free, kiln-dried recycled rubberwood and designed with water based non-toxic colors as accent. A small wooden playthings can produce big change. Through innovation and commitment to design excellence, PlanToys team of child development experts play a critical role in developing their selection of diverse wooden toys. Children can make a pretend cake and decorate for loads of imaginative play. This cake set from Plan Toys includes a cake with toppings, a cake turntable, a cake server and an icing bag. The cake can then be “cut” into 6 pieces for serving to guests. For children 3 years and older. Box measures 7.4 x 2.2 x 7.4 inches. Children today are bombarded with plastic, limiting toys that do not expand their imaginations or aid their development. Not only can plastic toys be harmful to children’s health, but the production of plastic toys further increases our dependence upon petroleum and leaves a greater carbon footprint than natural, wooden toys. There are many companies that produce wooden toys; however, not all of these companies provide information about the kind of wood they use or their sustainability practices. In addition, many of these companies manufacture their toys in China, where constant monitoring is required to ensure dangerous substances, such as lead, do not accidentally enter into production. Plan Toys is a company you can trust! Made in Thailand, this toy company’s ethics mean you can sit back and watch your child play safely with developmentally appropriate toys. 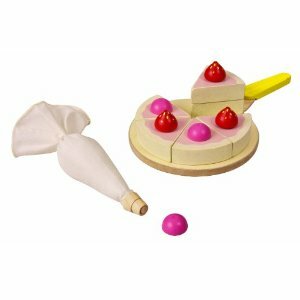 Although this cake set is not as fancy as other wooden ones, like [amazon_link id=”B0036IMSB2″ target=”_blank” ]Melissa and Doug’s[/amazon_link], it is definitely a greener toy! I trust Plan Toys. I would choose safety and eco-friendly over bling any day! So glad you posted this! Our daughter’s birthday is next month and I’m going to order it for her. We’re all about the wooden play food. Many thanks!